One of the most promising alternative prospects to emerge from Northern Ireland in an age, Fox Colony are on the cusp of making their mark. From the fuzzed-out tangents of opener 'Supermarkets' to the synth-driven 'Don't Keep Me Here', their new EP, Fragile, doubles up as an all-killer introduction to the Belfast band’s earworming indie-pop craft. Taking cues from emo-pop revivalism, and forging it with early 1990s alt-rock, it serves as an unguarded open letter to old friends, new plans, soulmates and moments that linger on from the past. 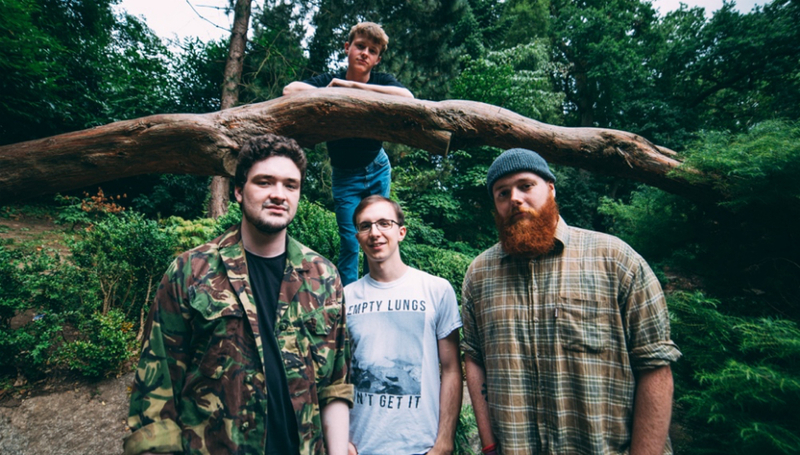 Ahead of a busy few months for the four-piece, we speak to the band’s frontman Darren Hill about vulnerability, making their mark, the scene and more. DiS: For those not in the know, how, where, and when Fox Colony first come about? Darren Hill: Fox Colony have been a band for just over a year and a half now. We went through some growing pains and line-up changes as all bands do, but I believe that the lineup is now the strongest and most consistent that it’s ever been. We’re all feeling very positive and excited about what the future holds, and that mindset has really helped us grow as a band. Myself, Daniel and Aaron originally met in school long before Fox Colony’s existence. We used to spend a lot of time in the music department where we would jam to Tom Petty songs and experiment with our own compositions as well. Those early experiences really taught us how to interact with other musicians in a diplomatic and meaningful way. Myself and Aaron are the two original members of Fox Colony with our old friend Dan and our ex-guitarist Fionn’s best friend, Aidan, joining a little later on. As soon as Dan arrived at practice, the chemistry from our school days arrived with him and when Aidan showed up his first practice with a pedal board akin to a small spaceship. We knew that they were both keepers! You’re about to release your second EP, Fragile. It’s the follow-up to last year’s Patterns. Listening back to the release, how do you think you’ve evolved as a band over the last 15 months? I feel that Fragile is an EP which contains a lot more self-awareness and a more direct way of telling stories than Patterns does. When I wrote the core songs for Patterns I didn’t feel that I necessarily knew what I was writing. I just knew that I had to write something, and I let whatever I felt at the time pour out into the notes section of my iPod with no thought of whether it was coherent or not. With the songs on Fragile, the meaning of the lyrics wouldn’t always be immediately clear but usually around halfway through the writing process I’d have a bit of an “Ahh, that’s what this is about” moment. There was a lot more pre-planning for Fragile. I definitely feel that my experience as a recording/mix engineer helped during the demo making process. We had a good idea of what sort of tones and arrangements we wanted before going into the studio which made a huge difference to our productivity. Our incredible engineer, Rocky O’Reilly, really understood what we were going for and helped those ideas come to fruition. Tell us about the kind of themes and ideas are to be found on this release. Is there an overarching sentiment or message to be gleaned across the five tracks? When writing these songs, I wanted to consciously be almost painfully honest in my songwriting, sometimes even naming names of people that I’ve had interactions with. If there is a broader message throughout the EP it’s in the delivery more so than the themes of the actual songs themselves and it’s that honesty is okay when it comes to how you’re feeling. As a man, I definitely feel that this is a message that isn’t taught thoroughly enough in our society when you’re growing up and that can lead to a whole lot of problems when it comes to mental health and the way that you treat people. I’ve kind of always used songwriting as a way to try and combat the expectations that were set upon me when growing up, I find it very cathartic. Basically, if we were all taught that it’s okay to feel sad and vulnerable, then the world would be a better place. For us, the EP sounds professional while retaining a nice, lo-fi air. Tell us about the recording process. Who was involved and how did you go about capturing the sound you wanted? We recorded almost everything live with the exception of vocals, synth and a few percussive parts. We find that recording in this way is what’s natural for us and it’s the best way to capture the feeling of the song and the moment. Rocky O’Reilly recorded and mixed the songs for songs for us in Start Together Studio and we had an amazing time during the process. It almost felt like we were all just meeting up for a chat about music and life and then occasionally we would remember to go in and do some takes. Before we knew it we came out with an EP. You were previously a member of Brand New Friend. Has leaving that band to focus on writing your own music, alongside the other Fox Colony members, felt like the right decision? Absolutely. I had some great musical experiences and met some amazing people from my time in Brand New Friend and I’ll always appreciate that. However, things began to feel very repetitive and cumbersome towards the end. There were a lot of disagreements and complications and I wasn’t enjoying myself anymore, which is pretty much the whole point of being in a band. In Fox Colony I feel that we have a lot more creative fluidity. We’ll often descend in to 15-minute-long post-pock jams during practice. Sometimes we write extremely poppy synth-based songs as well. Nothing is ever off the table and I very much thrive in that environment. Collaborating with everyone in the band is very important to me as well, it’s something that I felt was never really present to the same extent during my time in Brand New Friend. We’ve seen you been described as indie rock, indie pop, alt pop, emo and everything in between. Do you have a preference of the above? More importantly, do you actually care? [Laughs] Not so much. We usually describe ourselves as indie rock but to the average person that probably means that we sound like the Arctic Monkeys and that’s certainly not the case. Let’s go with Emo Tinged Synthy Indie Rock, that’s probably about right. Your lyrics are often refreshingly candid and unguarded. Has it always been important to you to wear your heart on your sleeve as a lyricist and songwriter? Thank you. It has, yes. The first bands that I felt I had a real connection with when I was younger were always extremely open in their songwriting and I think that’s a big part of what drew me too them. For me, it can be pretty terrifying playing songs live for the first time because I always have a fear that maybe I’ve crossed some line of vulnerability and said too much but if my lyrics were more filtered it wouldn’t be worth it for me. You list some seminal acts amongst your influences, including Modern Baseball, The Postal Service, Bright Eyes etc. How do you think you've filtered these sounds into your own approach, while maintain a strong sense of originality? I think that I’m able to do that because as well as listening to bands that we are similar too, I also listen to acts that are the complete opposite of Fox Colony. For example, I’ve been listening to the Deadmau5 album a lot recently as well as Bake Sale by The Cool Kids. On top of that, everyone in the band has such an eclectic taste in music that even if I write a song that sounds exactly the same as Death Cab for Cutie, by the time I bring it to the band and everyone adds their unique style to it, the song usually ends up sounding completely different. It’s one of the great advantages to collaboration. There’s a tendency in Northern Ireland (and elsewhere, too, it must be said) for some people to rattle on about how “the scene is the best it’s been in ages.” A lot of people would be inclined to agree to that nowadays. Would you? I think that the scene is in a very good place at the minute, especially with all the small local festivals such as Coaster and Curfew popping up. There are a lot of great bands around that genuinely make me proud to be part of the Northern Irish music scene as well. However, for me there are a few things that we could work on. I wasn’t old enough to experience a Radar gig in the student’s Union but they always looked incredible and It really was my aspiration to get involved in something like that. It looked like a very tangible scene and a regular gig night that people got excited about. I think our music sits best with Students as well so I feel that a regular gig night in the venue that will replace the students union could be very beneficial for us and a lot of other bands! I would also like to see a lot more of a connection between acts from the North and South of Ireland. We’re only two hours away from each other, let’s all get together and make one big incredible scene. Which Northern Irish/Irish acts are currently grabbing your ear at the minute? Tell us all about the lead single to be taken from Fragile. Why was it selected and what is it all about? It’s called ‘Supermarkets’ and it’s a song for anyone who has worked in a terrible retail job and had that feeling where you are trapped between the necessity for money and the necessity for good mental health and to do something you care and are passionate about. We selected it because it’s the song that we have the most fun performing and I think that really translates well in the recording. Fragile is launched at Belfast’s Voodoo in September 11. It’s quite the line-up. Tell us more about that. We’ve got the wonderful ROE, Cherym and Sweater Cult supporting us on the night. I’m a big fan of all three of these acts so it really is a pleasure to play alongside them. ROE has all of those sweet pop hooks and luscious synth tones, Cherym have this amazing early Alkaline Trio-esque rawness to their sound and Sweater Cult are a fairly new emo band and make us feel all of the emotions at once. We’re friends with everyone on the bill and that makes the anticipation all the more exciting for us. Hopefully, a good amount of people will feel the same way! Fox Colony launch the Fragile EP at Voodoo in Belfast on Tuesday, 11 September. Support at the launch show will come from ROE, Cherym, and Sweater Cult.